Windows Server 2008, Windows Server 2003. 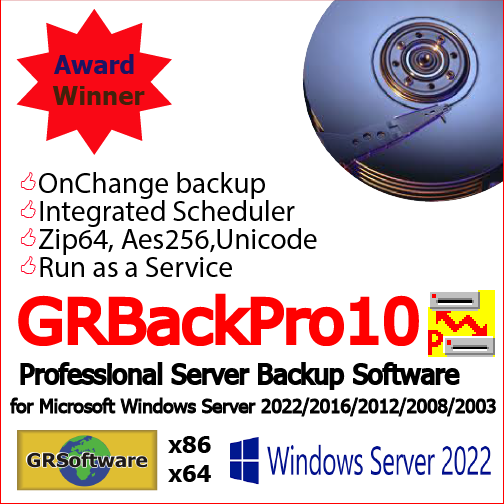 GRBackPro Windows server data backup software for Windows Server 2012 R2, Windows Server 2012, Windows Server 2008 and Windows Server 2003 is a professional Unicode based x86 and x64 server backup software designed to quickly and easily solve any server data backup problem at a low cost. GRBackPro Professional Windows Server Backup Software has been designed to permit reliable, fast, background backups on the Microsoft Windows Server operating systems, both 32 and 64 bit versions. GRBackPro Server has been designed to install it and then forgot about it: a typical situation for Servers. It runs in the background silently and registers all its activities in log files that you can remotely check. GRBackPro Server can send you email messages in case of backup errors. Like its Workstation brother, GRBackPro Windows Server has an integrated scheduler to define when different backups should start. Each backup event can have several related tasks run before and/or after the job so it�s easy to trigger activities such open or close a program, start or stop a Service, send an email, display a message, etc. GRBackPro is written in C++ for both x64 and x86 operating systems and has been deeply optimized in order to gain speed and efficiency, which are very important when choosing your server backup software program. Customers have tested the efficiency, memory use, and resource consumption of GRBackPro Professional Windows Server backup software, and have rated our backup software very highly. GRBackPro is really easy to use and setup. There are many options you can choose from, all well organized in tabs so that finding them will be easy and quick. One very useful option is that you can simulate your backup to check for every possible problems before you actually run a backup. We think that efficient backup software must not only do the job well and reliably but must also be well supported. As a dedicated backup software for Windows Server with excellent customer support, GRBackPro meets all the above requirements. GRSoftware has been on the market since 1997 -- we are a highly respected, world-wide retailer of backup software and our support team is ready to quickly answer all your questions. We offer a 30 day money back guarantee - click to buy the right license immediately! GRBackPro Windows server data backup software has been carefully designed to meet the Windows Server security specifications. To take full advantage of any new Windows features this version of GRBackPro Professional Server Backup requires a minimum of Windows Server 2003. A new, customizable look and feel has been implemented to make your experience even better than before. Using this server backup software is very easy, and most users find they don�t need to read any documentation, although a very complete set of documentation is included. The interface is very intuitive and the options are well categorized and listed in tabbed dialogs. A backup definition, called a Session, can have a number of different backup Jobs listed. Each backup Job allows you to define a source and a destination. You can easily back up a whole disk, a single folder or even just few selected files. GRBackPro supports network shares, hard drives, USB External and Pen Disk drives, CD, DVD-RW, DVD-RAM, CD-RW (if you have a packet write driver), any removable drives and any drive that can be seen as a drive letter under Windows Explorer (some Tapes can do that). You can perform a full backup, an incremental (update) backup or a differential backup (based on the archive attribute bit). You can simply copy your files or compress them inside standard Zip archives (or Zip64 if your files are bigger than 4GB) so that you can easily handle them using any archiver utility without needing GRBackPro to restore single files for example. Of course a Restore facility is also integrated in the software in order to let you restore a whole backup set with a click. One of the major advantages of this software is the option of installing it as a Windows Service so your backups can start even if no users are logged in. This is the typical use on Windows Server. The integrated scheduler lets you define when to start your backup automatically and allows you to specify conditions which must be met before the backup starts, such as availability of a network drive. Our software supports the Microsoft Windows Volume Shadow Copy so that you will be able to backup even opened and locked files. Another great feature is that GRBackPro will handle long path names up to 1024 characters and Unicode file names will be preserved characters even inside the zip archives. When GRBackPro Windows Server is running as a service and you remotely login on your Server while a backup is running, then running a second copy of GRBackPro from the start menu will open a Backup Admin dialog from which you can monitor your backup progress. You will get the normal interface as soon as the backup completes. If you have a big backup set, GRBackPro lets you split the set using the Split mode. A possible use for this might be if you want to burn DVDs after the backup has been completed (this is a fast and safer alternative to using packet write software drives). GRBackPro supports a History backup mode that allows you to keep multiple backup copies of the same file set. With GRBackPro Server Backup software you can execute one or more tasks before and/or after the backup or restore operations. For example, you can stop one or more services before a backup and then restart them when the backup is completed. Other available tasks are: close an application, start a program, pause the backup, issue a message box, end a process or send an email (with SSL/TLS support). This last facility lets you have your backup log reports sent to your mailbox if any error has been found in the backup. GRBackPro will also backup your registry files both locally (for an easy manual restore) or on the destination disk. GRBackPro Server Backup software is full software with many professional options, easy to use and quick when backing up files. that can be seen as a drive letter under Windows Explorer. Tape devices are not supported unless they are visible as a drive letter by Windows. Supports Unicode file names (even inside zip archives). Supports Windows Volume Shadow Copy (VSS) both on x86 and x64 systems. Supports Zip64 zip archive format to store files bigger than 4GB. Full, Incremental and Differential backup modes. Can include or exclude files and exclude or skip folders by name. Integrated powerful Scheduler with conditional backup execution. Support WinZip compatible AES256 encryption. Backup security attributes on NTFS file systems. Easy to learn and flexible tabbed user interface. Report tab to view, print and extract the backup and restore activities. Language translations will be available for both x86 and x64 versions. Online survey: Are we missing a feature do you need? Do you have any suggestion? Just tell us! 1 Server License US$199 To use the program on a Windows Server with maximum 5 workstations connected.